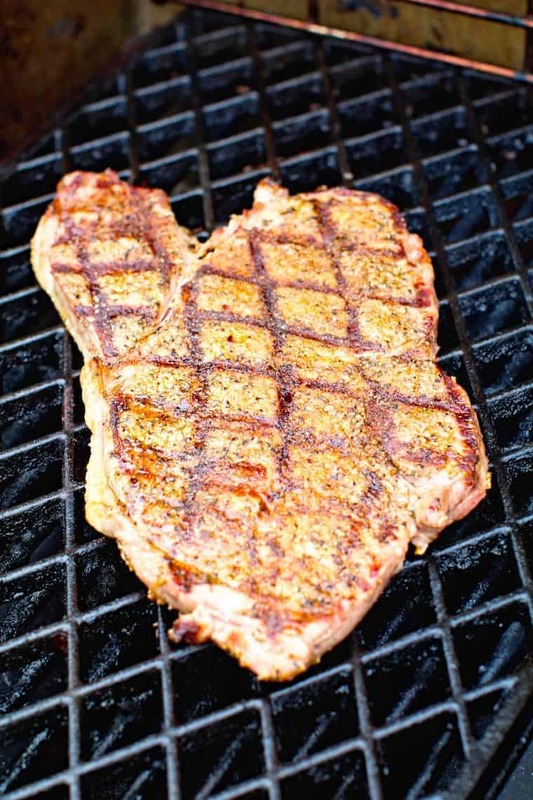 This homemade Montreal Steak Seasoning is the perfect way to season your steaks and potatoes! 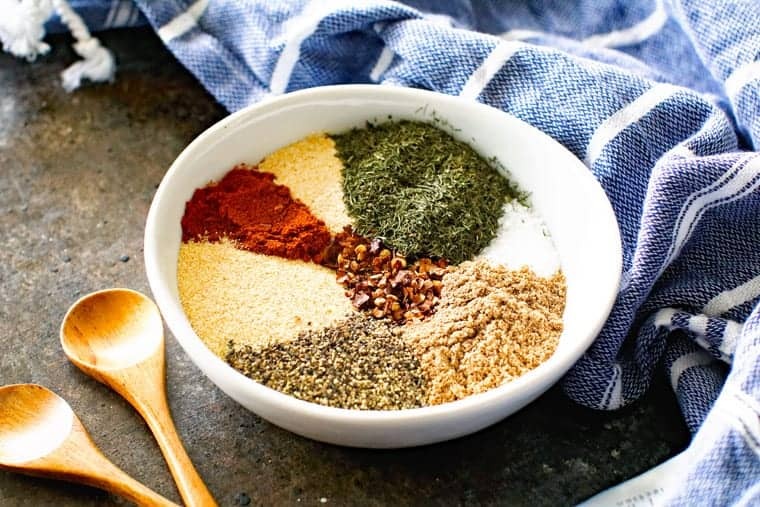 The best part is you have all the ingredients in your pantry for this copycat Montreal Seasoning! 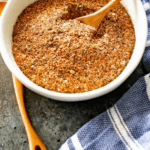 Grab them and make this easy steak seasoning! 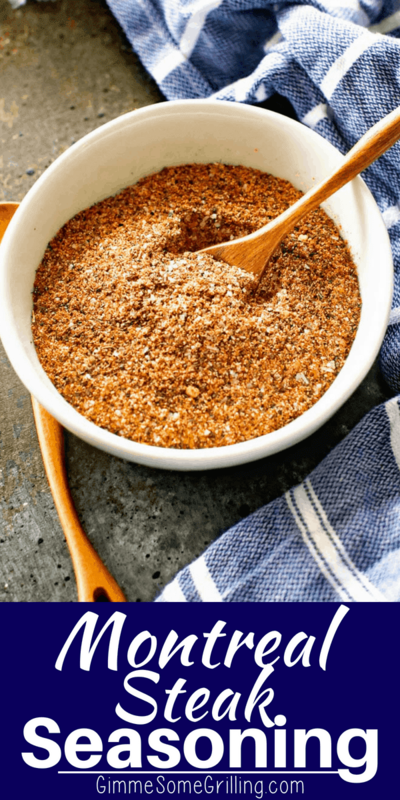 Of course great grilling flavor starts with a great cut of meat, but if you’re looking to pump up your grilling game, it’s time to make your own dry rub! 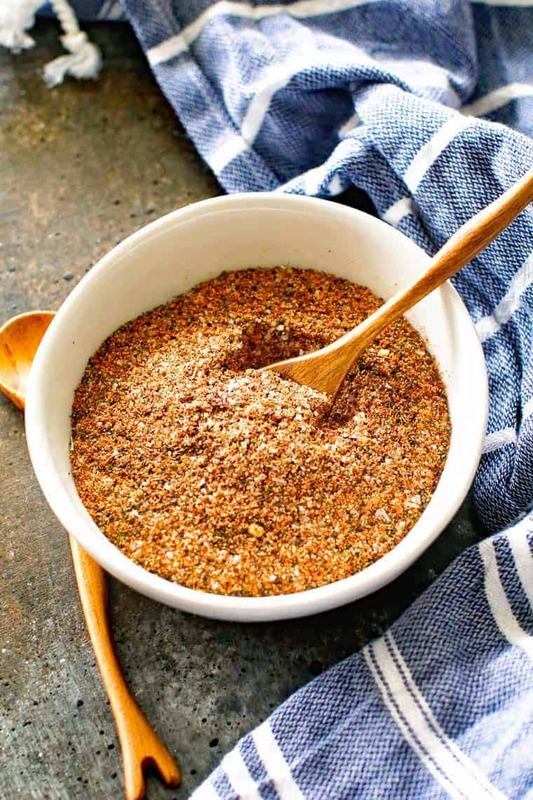 This Homemade Montreal Steak Seasoning is just what you are looking for. Full of flavor from spices including paprika, black pepper, salt, onion powder, garlic powder, coriander, dried dill and crushed red pepper flakes! I fell in love with the store bought Montreal Seasoning and I was on a mission to make my own after that. I love having it my cupboard to grab and use whenever I want and I also like that I know what’s actually in the seasoning! Make up a huge batch to have on hand because I know you will soon be seasoning everything with it! Why make your own? Well for a couple of reasons, you can certainly buy it but when you have all of the ingredients in your cabinet already, why not just make it yourself? Another reason I like to make my own is because I can adjust the seasonings to taste and there’s no preservatives. Plus it’s easy and tastes just that much better! What spices are in Montreal steak seasoning? 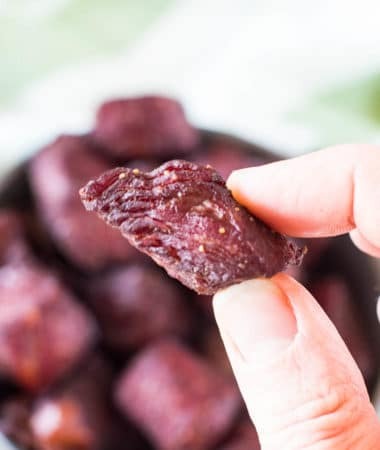 It takes just minutes to make and sealed well, it will last for months in your pantry! How do you apply a dry rub? Applying a rub is easy! Start by blotting the meat with a paper towel to remove excess moisture. Next generously coat the meat with olive oil. Now with one hand sprinkle on the seasonings, don’t forget to season the second side and the edges if it’s a thick cut of meat! Sprinkling with one hand and rubbing the spices in with your other hand will eliminate cross-contamination and be less messy. Don’t be afraid to rub it in well to completely flavor the meat! How long should you leave a rub on meat depends on the cut. Steak, ribs and brisket will really benefit with long exposure to all of these flavors. 2 hours, overnight, even a couple of days will make beef super flavorful! Pork and chicken – if you can leave it on up to 24 hours, the rubs will have soaked into the meat, so delicious! Fish and seafood are much more tender cuts and do not take as long to absorb dry rubs. 15 minutes to an hours will give you delicious flavor! 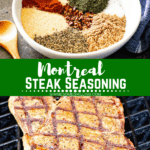 What are the benefits to making your own Montreal Steak Seasoning? Saves money $$$! Of course! You control the flavor and ensure it won’t be bland or too spicy! It tastes better! 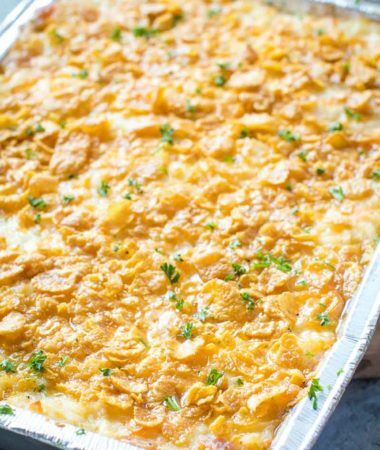 Hands down your homemade version will taste 100 times better than store bought! Here are some other great dry rubs that you can make at home! 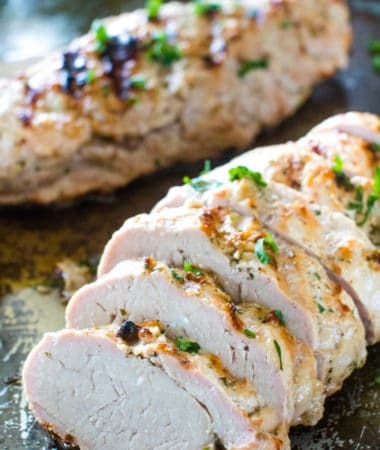 Lemon Pepper – this version includes fresh lemon zest, just think how much flavor it will have! 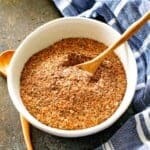 Homemade Taco Seasoning – why buy a packet when you have everything you need to make it at home! Chef’s Blend Dry Rub – this rub definitely brings the flavor and is great on beef, chicken, pork and seafood! Dry Rub for Pork – perfectly sweet, it’s the best balance for pork! BBQ Chicken Dry Rub – this has a ton of flavor and is delicious on chicken! Let’s talk about the best way to grill a steak! Start by taking the meat out of the refrigerator and allowing it to come to room temperature. For a steak, about 20 minutes. High heat on the grill, heat it up! Of course your steak is already oil and seasoned with Montreal Steak Seasoning, but if not brush it lightly with olive oil and season well. Grill to your degree of doneness, get that steak charred and golden brown because that is what will give it big flavor. After removing from the grill, allow it to “rest” on a platter, loosely covered with foil. This gives the juices time to redistribute into the meat. It makes your steak that much more flavorful, juicy and tender! Don’t forget to store your homemade seasonings is in airtight containers. A jelly jar works great for this! Seal jars tightly to keep the moisture out. Keeping the jars in a cool location and out of bright lights will help them keep their flavor and last longer. Mix together all ingredients in bowl. Store in airtight container. When ready to use it on a steak apply liberally if you want a kick or a little bit less if you don't want a kick! Big fan of making my own seasoning combos. Thanks for sharing! Now all I need to a juicy steak! That steak is calling your name!